Successfully Added K2 - Wristop Digital Compass, Altimeter, Barometer, Thermometer to your Shopping Cart. The K2, our first wristop computer! This quality device from Chinavasion is a digital compass, altimeter, barometer and temperature gauge all in one. It sports a 2-inch diameter readout display screen, and costs a fraction of what similar products sell for on the market today. Act now and get this amazing free car kit as well! Don't believe us? Search Google using the term "wristop" and see how much other wrist-top outdoor sports watches go for. Companies like Suunto, Casio, and Timex make similar products but they sell for 10-20 times more than the price of The K2 from Chinavasion. If you're a reseller, this is what you've been waiting for. You know what we're talking about - one of those guaranteed sellers that comes along every couple of months and makes you a ton of money in just a few days. We saw it happen with our Japanese-inspired LED watches and it's going to happen with these babies as well. They're guaranteed to sell out quickly especially at this great price! Digital Compass: Must be seen to be believed! Four bearing mode allows you to see compass directions and bearing in real time. Move the unit, LCD numbers immediately adjust to reflect new coordinates. The circuitry of this device also allows for external magnetic field calibration and declination settings! Digital Altimeter: Get instant readouts about your relative position to sea level in feet or meters. Great for mountain climbing, hiking, skiing, fishing or cross-country running. Digital Barometer: Atmospheric pressure on your wrist! It may seem like science fiction, but it's true and it's available on the CVLQ-G140. Digital Thermometer: Precise ambient temperature gauge, let's you be ready for anything Mother Nature throws your way. Both Fahrenheit and Celsius display are available. The K2 - Wristop Digital Compass, Altimeter, Barometer, Thermometer is your best sidekick when you're outdoors. It has a super bright 5 second LED backlight and oh yeah, it also predicts the weather based on temperature and atmospheric pressure readings. Did we mention it tells the time too?! 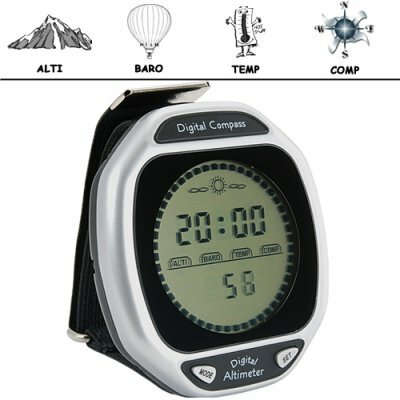 Pick up your digital wristop computer for the Great Outdoors today before we're out of stock tomorrow. Brought to you by the online leader of wholesale direct from China electronics - Chinavasion. This product is ideal for: Mountain climbing, Trekking, Wildlife safari, Angling, Gliding, Camel safari, Rock climbing, Camping, Canoeing, Ballooning, Desert Jeep safari, Mountain cycling, Bird watching, Parasailing, Motorbike expedition, Elephant safari, Skiing, Tree climbing, Snowboarding, Ice climbing, Canyoning, Parkour, etc. Easy to use. One button for switching between modes, and another for setting information. Act now and you'll receive the free car kit, limited quantities. While supplies last. Comes with free lithium button battery. Why is The K2 so inexpensive? If I buy this, what's the first thing I should do with it? That depends. If you're a consumer, climb a mountain. If you're a reseller, tell your bank to build another vault for all the money you're going to make with this baby! What is atmospheric pressure and why should I care?We're not Wikipedia, but think of it like this. Atmosphere though we can't see it, is composed of stuff. Stuff like oxygen, nitrogen, carbon emissions, etc. Those things have weight. Thing of all that weight as it weighs down on your body at any given time. That's why when you're on the top of a mountain you feel lighter - because a weight has literally been lifted off your shoulders!